He was born in New York City, the son of the late Dr. John Lanphere Dodge ( a Civil War Union Army Surgeon) and Cornelia Holt Dodge of Montreal. He became a drug clerk in Groton Conn., where he lived during his early manhood. At some point, he relocated to New York City and together with a chemist named Robert J. Bell, developed the formula for Pa-pay-ans, Bell. Prior to 1897, Bell was listed individually in the NYC Directory as a chemist with an Eighth Avenue address. I have to believe that this is the time and place where Bell & Dodge first developed their formula. The company was first listed as Bell & Co. in the 1898 NYC Trow Business Directory under the heading “Manufacturing Chemists” with an address of 110 John Street. The business was not listed in the same directory in 1897. They remained at 110 John Street until 1900, when they moved to 68 Murray Street. The Copartnership and Corporation Directory in 1900 listed John L. Dodge as president and R. J. Bell as secretary. According to 1940 legal documents, up through 1909, Bell & Co., Inc manufactured and sold Bell-Ans as well as a number of other products. At this point, Dodge formed a second corporation called Hollings-Smith. The incorporation notice was printed in the June 3, 1909 edition of the Trenton Times. Both Bell & Co and Hollings-Smith were New Jersey corporations with their main offices, plant and assets all located in Orangeburg. The stock of both corporations was owned and controlled by Dodge. Bell was no longer mentioned. In 1910, Dodge retired from active participation in both companies, turning the day to day management of them over to David Clark who served as director, treasurer and general manager. Dodge retained 75 % ownership with Clark the other 25%. In 1926, Dodge’s son, Joseph, become active in the management of the company and in 1933 Clark was forced out of the company as a result of conflicts with Joseph who, at the time, was an executive vice president. As far as I can tell, up through the mid 1970’s both companies remained under control of the Dodge family and continued to manufacture pharmaceuticals. For the treatment of dyspepsia, flatulence, nausea, vertigo, hyperacidity, palpitation and the symptoms of indigestion and the vomiting of pregnancy. Peritonitis, cholera morbus, alcoholism and seasickness. Digests every variety of food, removes every symptom of indigestion, restores the entire digestive tract to a normal condition. The dosage is recommended as follows: from one to three tablets before meals, or two hours after eating. In severe cases three tablets dissolved in hot water and repeated as necessary. the digestive principle obtained by our own exclusive process from the fruit of Carica papaya, combined with willow charcoal, chemically pure sodium bicarbonate and aromatics. However, in 1909, the August 11th Journal of the American Medical Association reported that the Council of Pharmacy and Chemistry had done a chemical analysis of the product, finding “charcoal, sodium bicarbonate, ginger, saccharine and oil of gaultheria (wintergreen) , but no papaya. 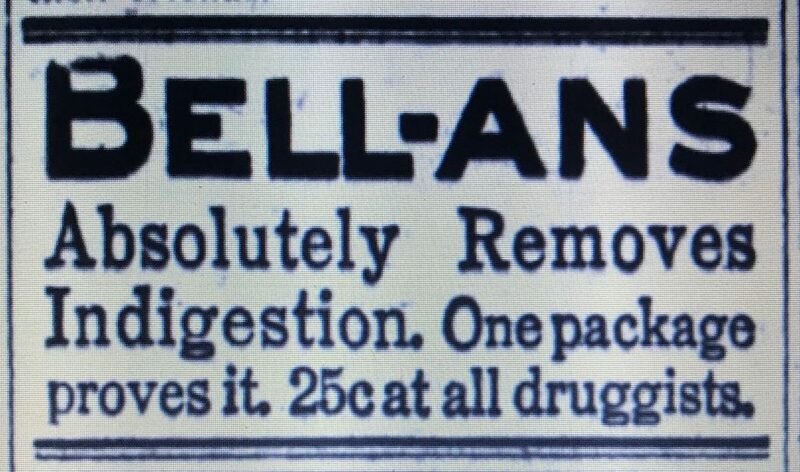 Ultimately, in 1914, Bell & Co., changed the name of the product to Bell-Ans. This caught the attention of the American Medical Association who published this opinion regarding the name change in their May 9, 1914 Journal. Within the past few weeks physicians have been notified that the name of ‘Pa-pay-ans, Bell” has been changed to “Bell-ans.” The reason for the change, according to the company, is that the new name is “shorter, pleasanter sounding and better.” As the most valuable asset of a “patent medicine” company is the name of its product, it is hardly likely that the name of Pa-pay-ans, Bell would have been changed for purely euphonious reasons. As previous analyses indicate that there is not, and probably never has been, any appreciable amount of papain in the product, and as the older name, “Pa-pay-ans,” carries with it the impression that papain is the essential drug, a more rational reason for the change of name should be sought. There is little doubt that this might be found in the federal Food and Drugs Act, especially that part which refers to misbranding. Bell & Co. are changing a misleading name into a meaningless one. 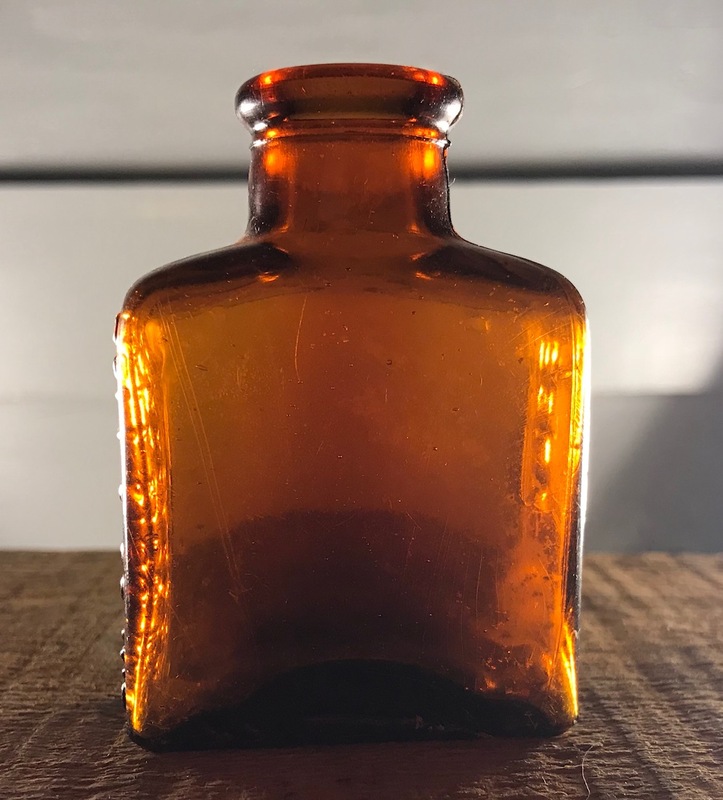 Reading some of the literature on “Pa-pay-ans, Bell,” might, if it were believed, lead one to think that with a bottle of this preparation on hand the balance of the pysicians’ therapeutic armamentarium could be thrown into the discard. 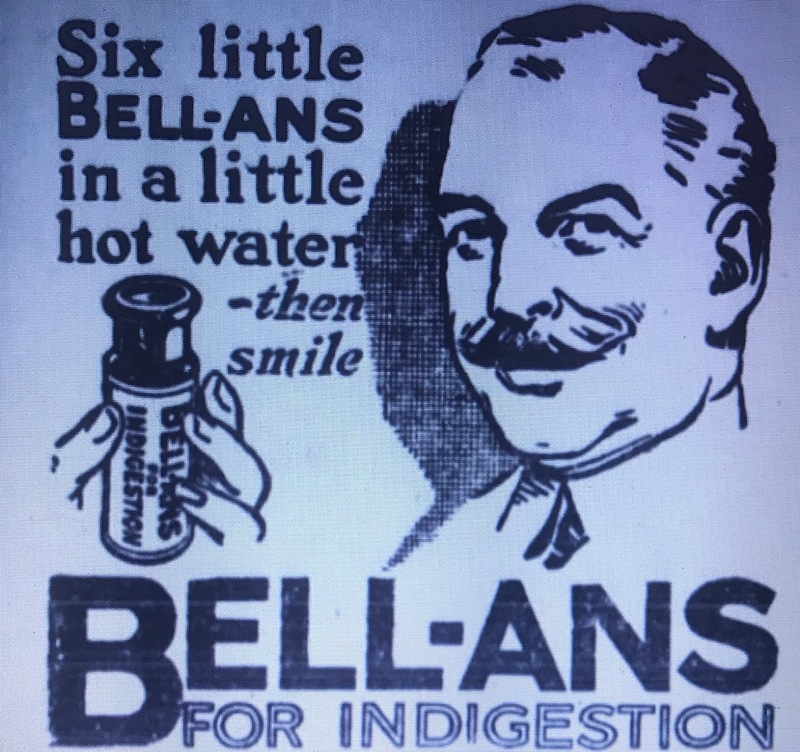 Bell-Ans (Pa-pay-ans, Bell) possess the virtues – and there are few – and the limitations – and these are many – inherent to a mixture of baking soda, ginger and charcoal. Any druggist could put up just as good a remedy, and any physician could write a prescription for a better one in those cases in which he might think it indicated. The whole secret of the commercial success of Bell-And lies in the mystery of it’s composition and the false and misleading claims that have been made for it. The same tablets put out under a non-proprietary name, as an open formula and with claims that were reasonable and true, would have practically no sale. Originally Bell & Co. marketed and advertised only to the medical profession, usually in the form of free samples and testimonials printed on advertising post cards. The testimonials were allegedly written by prominent physicians but the names of those physicians were never provided. Advertisements to the general public began appearing in newspapers around 1915. This advertisement from the October 1, 1915 edition of the Washington Post was typical of their earlier newspaper advertisements. Another advertisement, this one from 1918, calls for six tablets – double the dosage they recommended in 1909. Newspaper advertising continued into the 1960’s and 1970’s. 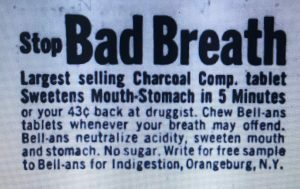 In the 1960’s the product was also being marketed as a cure for bad breath. According to the “Palisades Newsletter,” the Bell-ans patent was sold to Grandpa Brands sometime in the 1970’s. 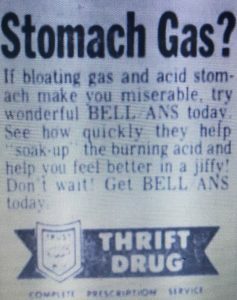 The last newspaper advertisement I can find for Bell-ans was in 1975 for Thrift Drug Store in Pittsburg Pa. Despite the negative attitude of the medical profession, Bell-ans was highly successful. The complex in Orangeburg New York was built on 1500 acres and included the main factory building as well as several smaller buildings used to house employees. A huge harness racing enthusiast, Dodge also built stables and a racetrack on the property. Located at the intersection of Route 303 and Kings Highway, the buildings still exist today and remain owned by the Dodge family. They have been given new life as the Bell-Ans Center of Creative Arts. The bottle I found is a machine-made small square medicine. One edge side is embossed “Bell & Co., Inc. Orangeburg, New York, U.S.A.” The other is embossed “Bell-Ans,” which dates it no earlier than 1914 when they changed their name. Next Next post: Fellows & Co., Chemists, St. John, N.B.